DAYLIGHT SAVINGS TIME STARTS IN THE US ON SUNDAY. 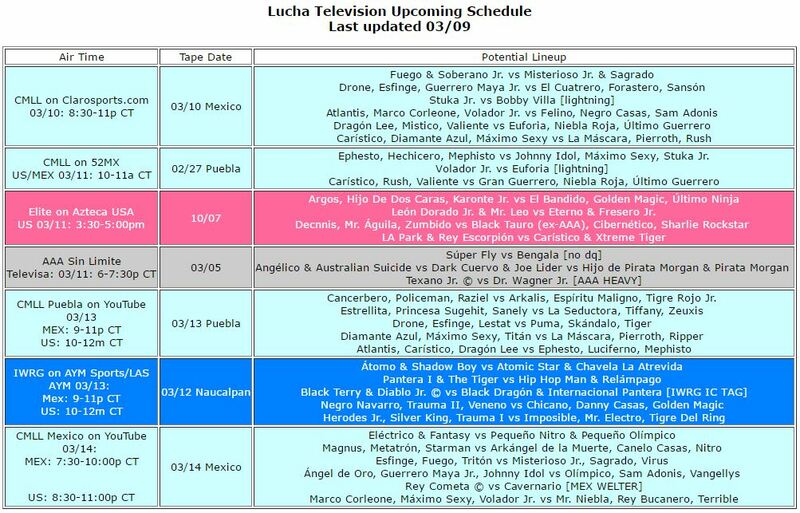 ALL THE CMLL STREAMS (and other less time sensitive material) WILL BE ONE HOUR LATER. If you’re in the US, it’s one hour later until the first weekend of April. If you’re in a place that doesn’t ever change times, it’s this way until October. This week starts the Apizaco taping on AAA TV, where a lot of strange happened. Maybe it’ll work better when it airs. CMLL Martes has Barbaro Cavernario vs Rey Cometa, which is a match you probably shouldn’t miss. ELITE USA is down to six weeks of TV. At least they may have reduced the entire lag if Elite actually starts running TV again – or maybe they’ll lose the slot? here’s a cool picture of Taurus for no reason/photo by Black Terry Jr. In an interview with ESTO, Mephisto, Ephesto and Luciferno say again they’re giving up the national trios titles before challenging for the world ones on Homenaje a Dos Leyendas. The story now is the commission says they can’t have both, but plenty of people with one singles titles have challenged for another one and a few have held multiple ones at the same time (Mascara Dorada, La Sombra.) This feels like the rudos are working their own angle with the idea that it’s selling their confidence in winning the world title. Hopefully the Panthers beat them on Saturday, possibly there’s going to be a trios title tournament to come, and it’s unlikely the Casas family will ever get a shot. CMLL mentions Shocker’s jaw surgery, blames Diamante Azul for causing it. No one’s jaw should be broken but I wonder what H2L would look like if Azul had accidentally broken Pierroth’s jaw instead. Shocker is listed on the April 8th Super X show, but the article gives no return date. Box Y Lucha is holding a teen’s lucha libre story writing contest with CMLL. This is aimed at older kids (15-17) then the one CMLL ran itself a couple years ago. ESPN Lucha Libre continues it’s CMLL interviews with one with Carisitco. It’s basically his usual Informa career interview, right down to pretending AAA doesn’t exist. (CMLL’s Miguel Reducino is listed as the photographer; this is CMLL PR.) Caristico talks about making four names into big deals and also talks about how he came back from WWE straight to Arena Mexico, not quite sure how those two ideas work together. (Maybe he means Mistico 2.0.) Caristico emphases how humble and free of ego he is, while explaining he doesn’t want to feud with Mistico II because he’d just easily destroy him. The WON mentions Yoshitatsu was slated to return to CMLL on May & June and the match with Volador might have been an attempt not to be invited back. A return fits with Tatsu specifically challenging Maximo in the post match interviews. FULL announced more dates for it’s Distromania tour with Alberto. In total, it’s May 19 (Friday) in Toluca, May 20 in Puebla, May 21 in Carpa Astro in Mexico City, May 26 in Queretaro, and May 27th in San Luis Potosi. This feels a lot like the Viva El Rey tour, but hopefully it’ll go a bit better. Rey Mysterio Jr. will be hosting a series of action movie shorts on El Rey on March 31st. Rey’s wrestling in Aguascalientes tonight, teaming with Willie Mack vs Brian Cage & Penta El Zero M for the Crash. Joey Ryan says he’s under a seven season Lucha Underground contract. +LuchaTV posted the complete Penta Zero M & Daga vs LA Park & Rey Escorpion. 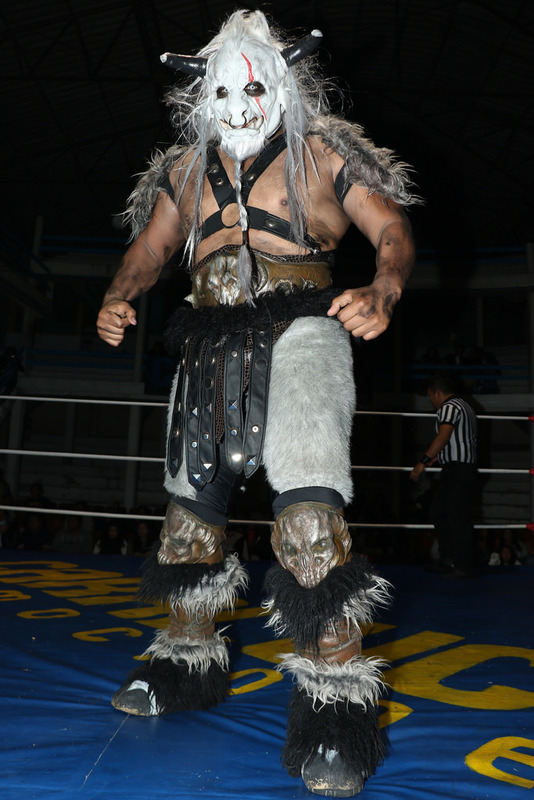 CMLL never bothered to give Cometa a title defense despite many obvious people to challenge him. Cavernario probably shouldn’t win, he should be challenging for bigger titles, but it seems like he’ll just get the title back. Undercard looks more iffy than usual. Main event is a rematch. Maybe they’re doing a Mephisto/Caristico title match here instead of the trios title match, especially since the Hijos del Infiernos won’t be national trios champions by the Tuesday after that. Full lineup for the last stop on the Freedoms weekend shows.